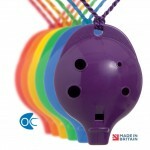 Ocarinas are simply the BEST! Fact. 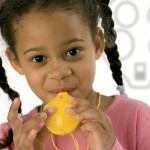 The rationale for teaching with Ocarinas can most easily be described by the acronym ‘KISS’. The KISS Principle, or ‘Keep It Simple, Stupid’, (Rich, 1995) maintains that most systems work best when kept simple, not complicated. The principle is exemplified by the story of a team of American design engineers who were given a handful of tools, with a challenge that the jet aircraft they were designing must be repairable by an average mechanic in the field under combat conditions with only these tools. Hence, ‘stupid’ describes how things can go wrong, and the level of sophistication needed in fixing them. My modern foreign language classes buzz with the sound of spoken German. Children confidently handle inflexion and vocabulary, ready to converse with a ‘sympathetic native speaker’ as required for GCSE oral. Visual stimuli – pictures, objects, actions – elicit words, questions, phrases, and even new grammatical structures; inhibitions are lost as students are immersed in an increasingly-familiar language.